If your in London do go and check out the show-studio exhibition at Somerset house, it runs until the 20th December and is well worth checking out. 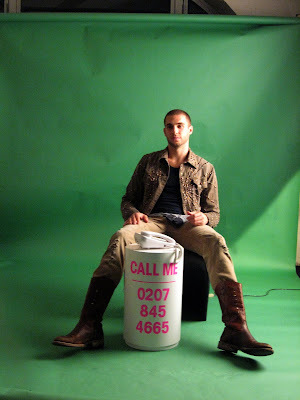 Showstudio.com has been online for 9 years and is the brain child of fashion photographer Nick Knight. The exhibition is based on the themes of Process', 'Performance' and 'Participation', and showcases over twenty projects from Show Studio's archive. As soon as you enter the exhibition to step into the mirror room...which you could literally spend hours in, mirror's on the ceiling, floor and all around you like a dome of observation. Leaving that you are confronted with huge over 10 feet tall Naomi sculptures with different images being projected on to her. You get a real sense of involvement in this exhibition, you can touch everything, pick it up, listen to audio and even call the good looking model sitting in the room. 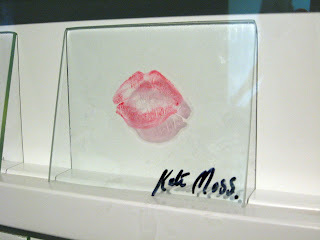 They have a cool collection of small class plates with lipstick kisses from famous models alike including Agnes and Kate Moss. The exhibition also host's a beautiful collection of various designers outfits, photographs and really inspiring fashion films. 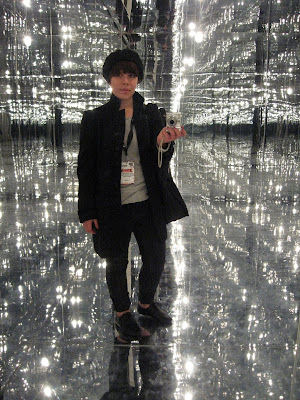 how fun is that mirror room? It is for exhibition like that that I wished i lived in London! Ooh exciting! I'm going there for college. =D Can't wait.